It seems like ages since we wrote our very first post (a real tear-jerker that makes us cry even today!) here at Small Fry and yet it was only a few weeks ago! While we’ve shared a lot of ideas in these few weeks, some elaborate, some inconsequential, it could be said that none will connect us more readily to our kids than sitting down and reading a book with them. Watching their little backsides settle into our laps, smelling their hair, feeling their soft skin on our arms and legs, watching their chubby fingers turn the pages. Feeling their chests rise and fall, or their shoulders shake with laughter. It really is one of life’s most simple pleasures and studies show the benefits to our kids’ well-being and intellect are staggering. What could be more important for a children’s lifestyle blog than to promote reading together? For today and tomorrow we have gathered our favorite bloggers from across the country and asked them to share their family favorites. Check back tomorrow to see the rest, and enter to win the whole series of our favorite bloggers’ favorite books! Being an English Lit. major and later a high school English teacher, I’ve always considered myself a lover of books and a total bookworm. So when my husband and I found out we were expecting a son back in 2010, I had many dreams of bedtime story sessions, trips to the library, and spending hours upon hours reading with our little guy. From day one we read to Henry, and now, two years later, our sweet boy is just as big of a bookworm as his mama. Our favorites change weekly and sometimes even daily, thanks to the insanely huge vintage book collection my parents kept in tact for my sister and me. My Mom is an elementary school teacher and former librarian, so you can imagine how many books she handed down for us to enjoy. And enjoy we do! Henry’s current favorite book is Crictor by Tomi Ungerer, a story from 1958 about a very distinguished lady, Madame Bodot, and her pet Boa Constrictor. Another current favorite is Mike Mulligan and His Steam Shovel by Virginia Lee Burton, a book about one of Henry’s favorite things in the entire world, big trucks! Reading with Henry is one of the sweetest things in my world, and I can only imagine one thing sweeter- the day he is able to read to me! ad over and over and over yet they laugh their faces off like it was the first time we’d cracked it open. I Love You Stinky Face by Lisa Mccourt.They enjoy it because of one obvious reason… anything close to the word “stinky” to a six and four year old is hysterical. And I don’t mind reading it for the umpteenth time because I can’t resist their cute, crinkled noses and their laugh helps me forget when I wanted to pull my hair out earlier that day. It’s a good one. Even though the pages are wrinkled, torn and we all practically have it memorized, it is far from ordinary to us. When it comes to reading with my kids I’m often drawn to books with bright colorful artwork, because they enjoy it AND I enjoy it. Sometimes I’m even inspired by the illustrations to sew clothes, like the Put Me in the Zoo outfits here. But I have to say that our all-time favorite stories are classic Curious George. They’re just perfect for all of our ages! My six year old Lucy can read the words to me or her four-year-old brother Owen. Or I can read the books to everyone. Or we just sit there oooing and ahhhing over the simple art (Lucy often asks which hot air balloon is my favorite when we get to that story). Or Lucy and Owen can flip through the books in the car. We love Curious George! I mean, who doesn’t? Just another two years till our baby Clara will love him too. on as they try to remember where he came from, “Don’t you remember? Your mother grew you in her garden. She said the hardest part was waiting, be patient, stopping herself from picking you too soon”. Little Pea by Amy Krouse Rosenthal was a gift to us when my first baby was born. It is quite the coincidence because it is such a parallel to his life, in a very opposite way. Little Dash sure has a sweet tooth, and the story teaches of a pea that isn’t allowed to eat his veggies unless he’s finished all his sweets. It’s a perfectly charming way to teach kiddos about the importance of eating healthy. We never tire of this darling little story. 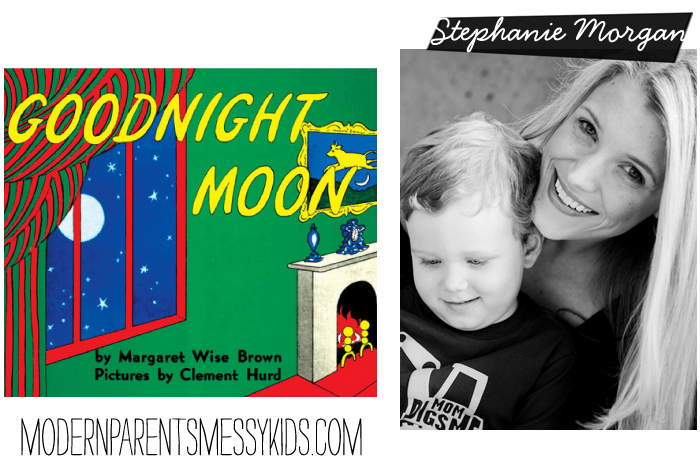 It’s old-school, I know, but I loved reading Goodnight Moon by Margaret Wise Brown to both my little ones when they were babies, even tiny babies. There was something so special about reading them the same words my mom once read to me. Even when they were too small to understand the story, my kids loved to watch me point to everything we were saying goodnight to and, bonus, when they got bigger we moved on to “Goodnight Seattle”. Did you guys know there are versions available for lots of different cities? They’re fabulous. >> We don’t know about you, but we’re all anxious to add these books to our own collections! Check back tomorrow for 5 more blogger’s pics and a huge giveaway of each of these selections! 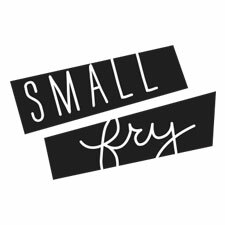 Have a great weekend everyone, thank you for reading Small Fry! Also, thank you to everyone who entered our Old Navy gift card giveaway! Congratulations to Megan, check your email for details! Love this post! Such a great roundup of authors… and from so many blogs I love! I did a post the other day on classic literature for my daughter: http://makingroomwithus.blogspot.it/2012/09/classic-literature-for-my-little-ones.html. I love reading to her; you described the experience so well! such a nice post! I love reading “with” my baby boy! I am a children’s librarian and love children’s books. Some of our favorite authors are Mo Willems and Oliver Jeffers. Everyone should check out their books and read them to their children. Mo Willems has hilarious stories and Oliver Jeffers has amazing illustrations. My kids love them and constantly check them out at the library. What a great list of books! I have tried to get books for my boys that they will have fond memories of. Our current favourite is “The Runaway Hug” and after we’re done reading it, they’ll ask me for my last hug and promise to give it back the next morning. Thanks for having us! And fun to see what others love too. Little Pea is a favorite for my kids. Yum, Yum, EXTRA Yum. One of my favorite posts you’ve done so far, amazing!!! So many white people….on this blog. Variety is the spice of life. we agree! we live in a not so culturally diverse area so have been brainstorming ways to incorporate children of other ethnicities. thank you for stopping by and we hope to have more spice soon! I love this post! One of my favorite things to do is read with my kids. It’s hard to pick a favorite, but we love the Naked Mole Rat Gets Dressed. Funny read! And for a sweet read, You Are My I Love You. My boys crack up in laughter over the book I Love You Stinky Face!!! It is probably my 3 year old’s favorite. What a great round-up – so many lovely books! Makes me quite nostalgic for when my boys were still small enough to toddle over book in hand and look up with an expression that was both a request and an invitation. Thanks for your comments on Where You Came From, Liz. I think I cheated a bit on that book and that really it’s as much for the parents as for their little listeners. We still read to out kids every night, my eldest is now 13 years old and although she thinks she is too old and she doesn’t want any one to know, she is not ready to give it up yet. cute!